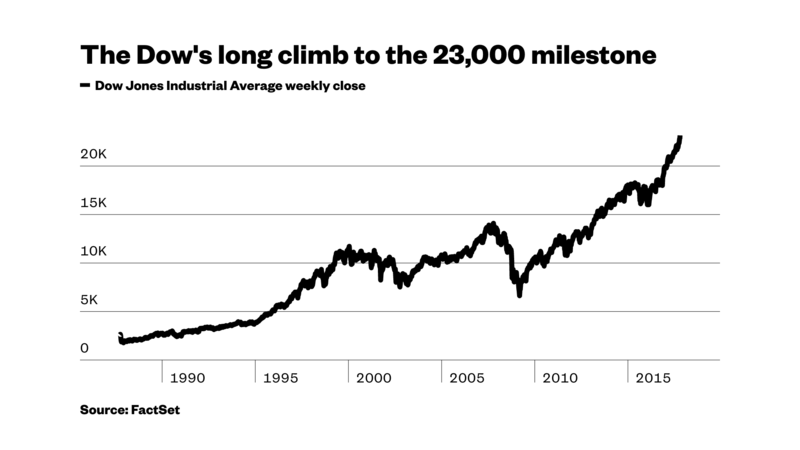 The most old-school measure of the stock market’s health, the Dow Jones Industrial Average, is poised to close above 23,000 for the first time on Wednesday, the latest milestone in a remarkably relentless run of new records for the market lately. A mix of factors has driven the frenzy. Unemployment and borrowing costs are still relatively low. Wall Street likes the proposed Trump tax plan. And corporate profit reports in the recently begun third-quarter earnings season have been good so far. A strong report by IBM, which is one of 30 component companies tracked by the Dow, was a major market catalyst on Wednesday. The tech giant reported stronger-than-expected profits and forecast sales growth for the first time in five years. IBM shares leapt nearly 10 percent, on track for their biggest one-day percentage gain since January 2009, and were responsible for the majority of the Dow’s 155-point gain in recent trading. There may be some obstacles ahead for stocks ahead, however. The Federal Reserve is widely expected to raise interest rates later this year as a way to keep the economy from overheating. And analysts’ expectations for the rest of earnings season aren’t that rosy. According to FactSet, analysts’ consensus expectation is that aggregate earnings for companies in the broad Standard & Poor’s 500-stock index will show a gain of just 2.3 percent for the third quarter once all the reports are in hand. The good news is that companies historically tend to do better than the expectations. But there’s still a good chance the current earnings season won’t match the 10.4 percent growth in S&P earnings that investors enjoyed for the second quarter. It took just 53 trading days for the Dow to go from 22,000 to 23,000, the fastest move to a new 1,000-point milestone. But as the index hits new closing records, each point move is less significant in percentage terms, MarketWatch notes. The Dow was first formulated in 1885 by Dow Jones & Co., publisher of the Wall Street Journal. It originally had 12 components but has since expanded to 30, hand-picked by a selection committee to be representative of various sectors of the American economy. The only original Dow component still in the average is General Electric. It didn’t contribute to the new record on Wednesday, however, as it slipped a bit.